← Shoes in the wardrobe! This book, I found to be a beautifully written, thought provoking and inspiring book. 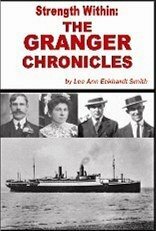 The family “story” has been told in such a way that I felt as though I was walking along side the author, as the book was bought to life with memories of relatives, photographs and further research. I especially liked that the footnotes appeared on the pages they pertained to. I was intrigued by the details of Robert McSorley. Each individual has been wonderfully bought to life and the author’s proudness of her relatives shines through. There is a sense of closure with the book in chapter 9, as the book draws to a close. I found the handwriting analysis of interest and it was a nice touch to such a book. There is something rather special in seeing not only the name of an ancestor in print in an original document, but also on seeing a sample of their writing. I notices throughout the book that the author mentions that she has inherited items from her family home, the chair with some varnish marks missing, and the bucket of nails. They don’t sound much, but there is something special, a kind of pull that makes you hold onto items from the family home. Even the incidental items. We all have our own bucket of nails that we treasure. In my case one of my most treasures items is an armchair, now residing in my study. It was my grandmother’s and bears the marks on the end of the arms, where she would hold onto, to enable her to get up. There is much in the book that reflects many issues of any immigrant family or individual. I have a particular interest, not only in genealogy, but also in my Italian ancestry. Although my own Italian line, didn’t leave Sicily for England until the 1950s, a branch did leave the rural community of Sutera in Sicily and migrated to the US in the early 1900s. The hardship, heartache and courage of previous generations should be forgotten and this book echo’s those sentiments. I had been looking forward to reading this book since I signed up for the book ring. In the meanwhile, I located the author’s web page. The book didn’t disappoint. Without Book Crossing I would not have come across this book, so thanks, not only go to the author, for a great book,clearly written from the heart and making it to my top 10 for the year. They also go to Book Crossing and the Book Crosser that shared the book. I’m going to order one for my permanent collection.